Home: Celebrities: On the Beach Contact! the film was designed to leave its viewers with. I had my son view it at the same age, and his exact words were; 'Everyone in the entire world should be made to watch it'. I have hoped for years that someone would publish something about the making of this poignant film. Thank you for maintaining such a wonderful site." - Jerry Merrell, USA, 10 Nov 2004. The story Mr. Norway is based on Nevil Shute Norway's time as a racing car driver in the 1950s, in his white Jaguar XK140. See more about the Jaguar on the Mr Norway page. Read more about his time as a racing car driver at the Racing page. This page gives some details of the movie On the Beach. Norway, writing as "Nevil Shute", wrote the book On the Beach, from which the 1959 movie was made. At the end of the movie, there is a scene of an Australian Grand Prix at Phillip Island, near Melbourne, Australia. Norway took up racing at least in part as research for the book. Did he also make a cameo appearance in the race scene in the film? For more on this, read the story, and see more below. 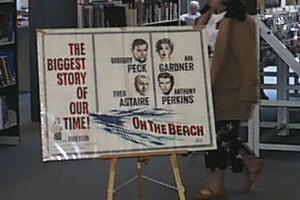 On the Beach was filmed in Australia in 1959, based on Nevil Shute Norway's book of the same name. It was produced and directed by Stanley Kramer, and was filmed in "glorious black and white". It was released by United Artists in 1959. A good source of movie info is the Internet Movie Database. See the IMDb entry for On the Beach for more info on the movie. From acclaimed director Stanley Kramer (The Defiant Ones, Inherit the Wind) comes this spectacular movie landmark - a film masterpiece with a message that will resonate as long as the world has the power to self-destruct at its own fingertips. The screenplay was written by John Paxton. In an odd twist of casting, the Australian actor John Meillon appeared as Yeoman Rob Swain, an American. A TV remake of the movie was filmed in Melbourne in early 2000, starring Armand Assante, Bryan Brown and Rachel Ward. See the IMDb entry for the remake here. This screened in the USA in May and June 2000. The video became available in October. 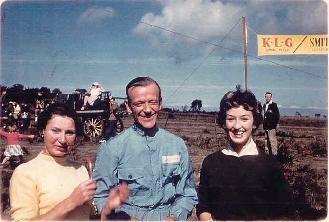 Near the end of the movie version of On the Beach, Fred Astaire's character Julian competes in the Australian Grand Prix at Phillip Island. The scene was shot at least in part on the Phillip Island racing circuit (see the Racing page for more info on the circuit), with the assistance of a number of well-known racing drivers of the day - more below. My info on the cameo appearance of Norway in this scene is based on my brother's recollections (he is a few years older than I am - he would have been 20 when the film was shot). There was a fair bit of discussion about the movie and a possible cameo appearance in the motoring magazines of the time. It seems likely that a cameo was originally intended. Stanley Kramer's film crew and actors, with the exception of Fred Astaire, were persistently and uniformly ill mannered to Dad, and I don't think he went anywhere near them. Also, I think that Dad had stopped racing when the movie was made - after his first stroke. The main problem, it seems, was Kramer's alleged distortion of the two main characters when, in the mountain hotel bedroom scene, the inference was that they "hit the sack." In the book, Peck's character is loyal to his dead wife right to the end. Kramer felt that it was totally unreasonable for a man in Dwight's situation to remain loyal to his convictions, given the awful circumstances. ... There were also problems with different cultures causing friction. Shute was a "well mannered English country gentleman," whereas the people from California had different ways and customs. Seems that these factors had some bearing on the ill feelings. As a result of this difference of opinion, Norway is said to have refused to appear in the movie. The conflict over the interpretation of the book may well have soured relationships. The people Philip contacted in his research into the movie gave "an entirely different perspective. Kramer, Peck, Perkins, Ivan Volman (Assistant Director) were absolute gentlemen." Phil Irving (who at one stage worked with Repco) wrote about the filming of the movie in 1992 in Phil Irving - an Autobiography. Irving refers to Norway and Kramer having a "blazing row" about the interpretation of the book, He quotes Norway as saying, "If Kramer wants a Jaguar, he will bloody well have to buy one." Norway taking up motor sports late in life made me start thinking. It is very similar to the character of Julian Osborne in the book - he held a life-long ambition to drive, and only did so when his circumstances changed. Talk about art imitating life! Information from Peter D'Abbs indicates that Norway was definitely part of the "in" crowd in the racing scene of the day. He was good friends with Lex Davison, and a number of others. Certainly, a number of these drivers took part in the filming. Is it possible that Norway came along - and maybe raced as well, without Kramer or the crew being aware of his presence in the crowd? Did any footage of him end on the cutting-room floor? I received further information from one of the last surviving racing legends of the day, Lou Molina. Molina said that he remembered Norway being present at the time of the filming, but was unaware of exactly what he was doing there. If he had actually been driving, it would be expected that Molina would have known. Philip Davey told me that during publicity for an exhibition of On the Beach memorabilia in late 2004, the Mayor of Frankston was talking to radio announcer Lynne Haultain on 774 ABC Melbourne. During the interview, a caller rang through to relate how he had met Shute at the car-racing scene. That's at least two people that claim he was there! Was he there? Was the Jaguar there? It seems unlikely, but there also seems to be a number of unanswered questions. Now, forty-five years after the event, some questions may never be completely answered. Although the scene is set at Phillip Island, and Kramer spent two days filming there, very little of the final film shows the Phillip Island footage. The Island shots are quite obvious - the scenery is fairly flat. The other shots, which feature the various car crashes, clearly have some high hills in the background. All these stunt scenes were filmed in September 1958 at Riverside Raceway in California, and edited into the film later. The filming was described in some contemporary magazines. See copies of these on the Web, including photos taken during the filming, at Frank Sheffield's The Pits. Philip Davey has obtained a complete list of the Californian drivers, along with their addresses and phone numbers, the cars and the value of each car! He even has details of an insurance claim for an injury during the stunts. There are 14 cars on the list. The drivers were paid $150 a day. There does not appear to be an XK140 Jaguar anywhere in the race scene, but a Jaguar does appear at least twice in the California filming. It appears to be white, or at least a light colour, but looks like an XK120. Oddly, the only Jaguar that appears on Philip's list is a 1957 D-type, so there's another mystery! There were no crashes at Phillip Island. Kramer hired the Phillip Island circuit for three days, at a fee of £A150 per day. It rained on the first day, but all the filming was completed in two days, although he paid for the third. Peter D'Abbs states that the other drivers most likely included Doug Whiteford and Alan Jack. Ian McDonald was to appear, but was unable to make it on the day. Philip reports that these drivers apparently "did a wonderful job - they finished up doing what nobody had been able to do since shooting had started - they satisfied Kramer with one take." It was noted at the time that a Monza in the correct colour of red was available locally - not only did Kramer not need to bring one out from the USA, but it was the wrong colour anyway. Lou Molina told me about taking part in the filming with Stan Jones (the late father of Alan Jones, world Formula One champion a few years ago). Molina also provided the racing sound effects. He took the sound recording technician around the circuit at full race speeds for some of the sounds. The technician was apparently terrified, and shook Molina's hand in thanks for a number of minutes afterwards. At another stage, they recorded the sounds of tyres screeching under braking. The filming of the race scenes was also somewhat hair-raising for the drivers. Molina and Jones were coming down the main straight at 135 mph (about 215 km/hr) when the ambulance pulled out on to the track in front of them - a terrifying experience. Molina let Jones past him as they avoided an incident that would have required a real ambulance. The boom crane camera also caused a number of close encounters as it whipped up out of the way of the drivers at the last second. Molina recalls being close enough to "see the brand of cigarette the operator was smoking." Molina and Jones' wives both appeared as extras in the stands, which required them to cross the track a number of times for different scenes. This accords with Peter D'Abbs recollections that the wives of some of the drivers appeared as extras in the movie. He particularly remembers the wives of Doug Whiteford and Alan Jack, and believes that they were used as models for some of the characters in the story of On the Beach. He remembers particularly their "beehive" hairstyles. Judy Miller, Aussie's wife, was also used as a stand-in for Donna Anderson at one point. This was done without any real pre-arrangement - she was just asked to walk away from the camera during filming. A party was held at the Isle of Wight hotel in Cowes after the first day of filming, which continued all night. Molina remembers Fred Astaire as "fantastic" - the life and soul of the party, complete with tap-dancing. They drank the hotel out of champagne, then had to drive again for filming the next day, with Jones in particular somewhat ill! Molina claims that Jones spent some time in the ambulance that was on the set between takes, breathing oxygen. The following photos were taken at Philip Island during the shooting of the location scenes there. They have been kindly supplied by Judy Miller. 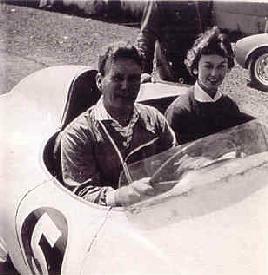 The pictures show some of the cast, Aussie and Judy, Stanley Kramer, and Marj Stone, who was the wife of another Australian racing driver. Click on the thumbnails below for a bigger picture. Aussie Miller in the Monza brought out from the USA for the character Julian (Fred Astaire). 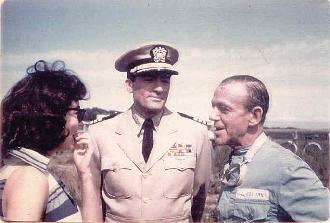 Marj Stone, Fred Astaire and Judy Miller. Aussie Miller and Fred Astaire. Ava Gardner, Gregory Peck and Fred Astaire. Aussie and Judy Miller in Julian's Monza. 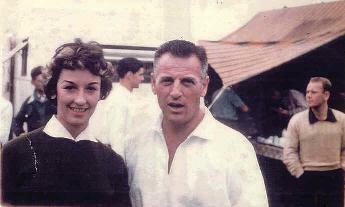 Judy Miller and Stanley Kramer. 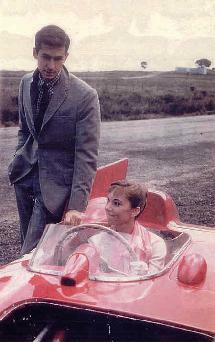 Photos: Judy Miller Anthony Perkins and Donna Anderson, with Lou Molina's red Monza. I had the privilege of speaking to Lou Molina on 15 October 2000. Sadly, he passed away in 2002. Molina, then aged 80, was not only one of the legends of the races of the 1950s, but was still racing in 2000. On the weekend before I spoke to him, he had competed at the Mt. Tarrengower hill-climb at Maldon in western Victoria, in his classic supercharged MG. 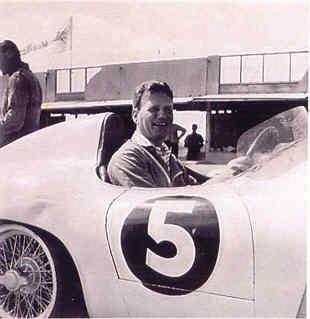 He competed in the Australian Grand Prix races in 1953 and 1958, and competed overseas, including in Bangkok. Molina was also famous as a restaurateur. I can remember visiting his last restaurant, the Anchor and Hope in Richmond (an inner eastern Melbourne suburb) some years ago. The Anchor and Hope has, sadly, since been demolished. During the filming of On the Beach, a number of the cast frequented Molina's restaurant, then located in the Imperial Hotel on the corner of Bourke and Spring Streets in Melbourne City. Molina particularly remembers Ava Gardner and Gregory Peck visiting. The hotel is still there today (but not the same restaurant), over the road from the Victorian State Parliament buildings. A number of notable people frequented this restaurant, including Norway himself - it is just a couple of blocks from the Melbourne Club, where he was a member. Molina also met Norway frequently at Phillip Island and Rob Roy, another hill-climb venue of the day (see the Racing page for more info). Molina didn't always spend time with Norway at the events, as he was usually busy in the more serious races competing with Len Lukey, dicing over hundredths-of-a-second timing differences. There is another scene featuring a sports car being driven very fast by Ava Gardner's character near the end of the film. This scene was filmed at Barwon Heads, to the south-west of Melbourne. I have been told that the stand-in driver for Ava Gardner was Betty Morgan, another person associated with motor racing in the 1950s. It is not clear whether she actually competed in any races. One story has it that she had her own car dealership in Elizabeth Street in Melbourne. First Prize went to Les Murphy's immaculate Q-type. ... A blushing Rod Murphy received the laurel wreath and an almost lingering kiss from Sun girl Betty Morgan. Rod then did a tour of the straight to allow everyone to see not only the Q-type, but a very decorative Miss Morgan. Peter D'Abbs tells of various scandals rumoured of Betty, including an apparently destructive affair with "Crash" Kavanagh, one of the more colourful racing drivers of the day, who took her to England with him, where she "went off the rails". There is a reference on the Repco Web site to an "unnamed futuristic sports car" made by Repco being seen in the movie. This car was also showcased at the Silver Jubilee International Car Show in 1959. The author brings to life the journey of this extraordinary film and an authentic re-creation and representation of my husband's work and legacy. Mr. Davey takes you back in time so you... will experience the ups as well as the downside of motion pictures. It is a must read for anyone who cares about motion pictures... You will be richer for the experience.  from the foreword by Karen Sharpe Kramer, Los Angeles, California. I first heard from Philip in May 2000. Much of the info on this page comes from his six years of research into the movie. He has been in touch with many of the cast and crew, accessed the collection of Stanley Kramer papers at UCLA and collected a fantastic array of press reports, photos and memorabilia, including the movie script. As part of the activity around the book, Karen Kramer and Donna Anderson put on a special screening of the film in Los Angeles on 15 Oct 2004, with 300 in attendance, including many agents and other influential people. The book was published in a bound hardback edition, comprising 272 pages, with many previously unseen photos and illustrations - some in colour. It includes numerous anecdotes and interesting stories from behind the scenes. The book covers, amongst many other things, Stanley Kramer's turbulent relationship with Nevil Shute Norway. It is structured with self-contained chapters about filming at the various locations around Melbourne and Victoria. Why write a book about this film many have asked? I was two and a bit at the time, have no memories of the film. However, from my own father, who met Fred Astaire at the Melbourne Showgrounds, my interest has grown over the years. Certainly the theme is very important and the fact that some of the scenes in the movie were filmed at everyday places for me, make it all the more realistic. There was also the enormous effect its production had on the people of Melbourne. We were besotted by Hollywood stars and the American culture. Australians in the 50s were still victims of a "cultural cringe"... Nowadays the "tyranny of distance" has been smashed so we don't bat an eyelid at visiting stars any more. The book is no longer available for purchase, but copies are available at a number of libraries. In Australia, it is available at the State Library of Victoria, State Library of NSW, Deakin University, NLA, NFSA, Frankston, City of Casey and Chisholm TAFE libraries, among others. In the USA, copies are available in Los Angeles at the UCLA library and at the Margaret Herrick Library at the Academy of Motion Picture Arts and Sciences. Since publishing the book, Philip has been engaged in a number of related activities, including contributing to a 2009 BBC4 radio documentary, Fallout from the Shore. (A copy of the audio file of this is available on CD from Philip - contact him by email.) He has also worked with an Australian film team developing a documentary about the making of the movie, aptly titled Fallout. At the time of writing, this documentary was being edited for release at the Melbourne Film Festival in 2013, all being well! After a battle getting this movie underway, funding has been provided by Screen Australia and Film Victoria. Philip is hopeful that the movie will be picked up by the ABC or SBS (in Australia), or perhaps the pay TV history channel. An essay summarising the story of the making of the movie is also available on the ACMI website. On 1 Nov 2004, Philip alerted me to an exhibition at the Frankston Library. This was part of a state-wide treasures @ your library campaign, organised by Helen Diggerson, Public Relations Officer of the Frankston Library Service, seeking to acquire local historical material. 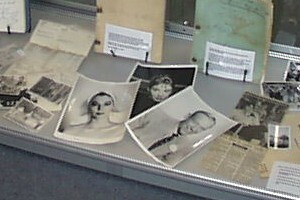 A preliminary exhibition, to flush out more information or memorabilia from the filming, was held at the library from Tuesday 16 Nov to Sunday 5 Dec 2004. This was a lead-up to a major exhibition at the Frankston Cultural centre from Saturday 8 to Monday 31 Jan 2005. The exhibition was publicised in the Melbourne Herald-Sun's Weekend magazine of 6 Nov 2004, in the article Sands of time. Philip presented the library with a draft copy of his book, and the opening day featured a screening of the movie. The display... consists of a wonderful range of memorabilia: private photos, letters, production stills, lobby cards, production material; even immigration records of the stars, would you believe. There is so much material I haven't seen, and people I've not met - I'll now have to do an update! In attendance was Cherie Borthwick (now Cunningham) - [one of] Ava's stand-ins, David Holst - the "Green effects man" (he did all the garden outside the Holmes' house during the party scene), Vicky Fairfax - wife of the late George Fairfax who had a role in the party scene, and many others involved in some way or another. Another one of the greats of Australian Television - Norman Yemm - was also in attendance with some great yarns about his first role, which just happen to be as a sailor in OTB. Another highlight was the appearance of the Bentley, specially bought by Stanley Kramer, to chauffeur Ava Gardner around Melbourne. The library tracked the car down to a family in Gippsland (Victoria) who have owned the vehicle for 30 years. Quite amazing! Helen Diggerson is to be commended for an outstanding job in coordinating this event, which was assisted nicely by a comprehensive media campaign. This was publicised on page 24 of the November/December 2004 Frankston Community News (no longer available online). One of the most famous events from the filming of On the Beach was the report that Ava Gardner referred to 1959 Melbourne as the "ideal place to film the end of the world." This line was actually invented by Neil Jillett, a journalist exasperated at being denied an interview with Gardner. He was working in the Melbourne office of the Sydney Morning Herald at the time, and had been asked to write a story on Gardner by the Sun-Herald, the Sunday paper in the stable. Jillett inserted the famous quote in the last paragraph of his report as a joke. His Sydney editors modified his report, and printed this line as fact. Jillett, more recently well-known as a movie reviewer with the Melbourne Age, made a detailed "confession" in The Age in 1982. Philip Davey spoke to Jillett recently about this story - he said that he was quite embarrassed about "that ridiculous business with Ava Gardner." Richard Michalak, of the Nevil Shute Society, states that Sydney, Australia, "was once described by a delayed, frustrated and Customs-infuriated Nevil Shute as 'An ugly town, full of drunks.'" Given the somewhat legendary rivalry between Melbourne and Sydney, maybe there is some form of poetic justice here? 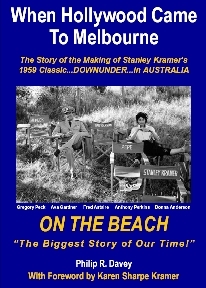 When On the Beach was released on 17 December 1959 at the Regent Theatre in Melbourne, a local TV station (HSV7) screened a thirty-minute documentary about the filming. Philip Davey has been advised by the Seven Network archivist that this footage no longer exists. Some of the film was shot at Canadian Bay, near Frankston to the south of Melbourne. A private enthusiast apparently filmed some of the activity on Super 8 film. This is available for viewing at the Performing Arts Museum in Melbourne (8 minutes of colour, but poor quality). Some of this and some newsreel footage can be found on the documentary film Melbourne in the Fifties, released a couple of years ago. I heard from Kevin in October 2013 that "In one scene, Gregory Peck and Ava Gardner are walking down the street, and a group of kids on bikes cycle past. The kids had heard that Peck and Gardner were doing a scene locally, and decided to go down to watch. Apparently the director, on the spur of the moment, decided that having the kids ride past would add a nice touch for the scene. Each of the kids got paid 10 pounds for appearing in the movie - quite a lot of money in those days. I know this detail as my aunt was one of those kids - she's the one with straight, shoulder-length blond hair." On Wednesday 2 Feb 2000, the ABC (Australian Broadcasting Corporation) quiz program Flashback featured a newsreel clip of the making of On The Beach, showing some scenes in Melbourne and shots purporting to be of Norway hobnobbing with the film crew. Copies of this and a number of short news clips are available from the ABC, but apparently at a prohibitive price. Gregory Peck dismissed assertions that the controversial film would hurt his career, pointing out that similar things had been said about his Gentleman's Agreement. The film introduced a surprising "new" talent: song-and-dance legend Fred Astaire in his first strictly dramatic role. The film was shot primarily in Australia, which lacked extensive filmmaking facilities. "I had to build a studio from the ground up," commented Stanley Kramer. Australia did have a pioneering movie industry very early in the century - but I dare say whatever we did have in the fifties would have looked very different to Hollywood! Some of the filming of On the Beach took place on a property in the outer south-eastern Melbourne suburb of Berwick, at the Wilson farm in Harkaway Road. 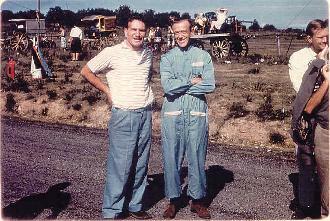 The film crew was there for three days (January 15, 16 and 17, 1959) and each day was 110° F (43° C). Filming was difficult because of the flies, which probably contributed to some scenes being omitted. This may explain a story that this location was not used as planned. However, the final movie has about four minutes from the Berwick filming. Shute Avenue and Kramer Drive in Berwick were built over the former property, which was sub-divided and built on in 1970. It is rumoured that guards at each end of the Golden Gate Bridge were paid $500 each to stop cars for a minute to get footage of an empty bridge. Continuity: Mary points out to Peter that if he needs to get into Melbourne by 11:00 for his appointment with Admiral Birdie, he'd better hurry. By the clock on Admiral Birdie's office wall, Peter clearly arrives for his 11:00 appointment at 10:05! Factual errors: Characters in the scenes set in Australia are seen to turn the lights on in a room by flicking the wall switch upwards. In Australia, the opposite is true - you flick the switch down to turn a light on. Philip Davey also discovered that two of the stunt men in the Californian filming of part of the race sequence, Dale Van Sickle and Carey Loftin, also featured much later in the classic 1971 movie Duel, in which Loftin played the part of the murderous but unseen truck driver. He even found a movie scene featuring a cameo of Australian TV personality Graham Kennedy that was cut from the final version. Another item of trivia Philip reports is that the mountain hotel bedroom scene with Gregory Peck and Ava Gardner was the "first ever 360 degree pan shot." A member of the production crew present at the filming of this scene described the use of a circular rail for the camera. Apparently, there was another first in cinema history in the scene where Peck and Gardner are seen embracing into the sun at the end of the film. There was a review of the movie published in Les Lettres Françaises (French Letters, believe it or not!) on 24 December 1959. The title of the movie in French was apparently Le Dernier Rivage, which translates as The Last Shore. This title perhaps better catches the mood than the English title. The original French book title was simply Sur la Plage - On the Beach. All content Copyright © Keith De La Rue 1998-2013.